Quest Diagnostics has been a leader in the movement for consumer empowerment in healthcare. The company has been a strong advocate in the effort to provide patients with direct access to lab testing through QuestDirect. 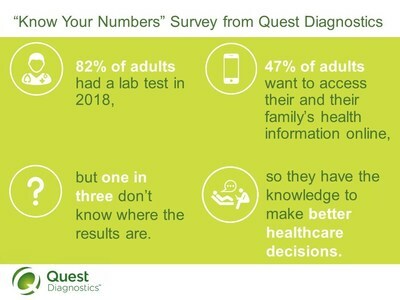 More than six million patients track and access their lab results and health data through Quest Diagnostics' MyQuest website and mobile app. The company further expanded convenient access to testing services through its recent collaborations with Safeway and Walmart and expects to have well over 200 patient service centers in retail store locations by the end of 2018. Additionally, the company provides genotyping test services on behalf of Ancestry's AncentryDNA, a service that today identifies and quantifies an individual's ethnic origins based on results of DNA testing and Blueprint Fit, the first athlete-specific direct-to-consumer service from Quest Diagnostics.